Note: In case if your problem statement is updated, please donot hesitate us and send it to us at support@iqrajavaid.com. We would surely like to help you in this regard. Summary: A new 007 employee is working on a classified mission. The program will randomly pick an expected profit to and the user will attempt to guess the random number. c.	How to provide user notification (without providing duplicate messages). a.	Random.Next Method (Int32, Int32). Read the MSDN parameters very closely! 2. Rename ‘Form1.vb’ to FirstName_LastName_P2.vb (for example, ‘John_Smith__P2.vb’). 4. Create a Help menu bar item that uses a msgbox to show valued info on program usage, rates and program requirements..
7. Code is easy to read, ie general programming practice. UI items and variables are named meaningful. Not just, emp3, ckboxA, Label7, button1, txtbox2 etc. 10. Random number generated is between the range of >=1 and <= 900. 11. When the user clicks guess, every guess text is cleared from the textbox. 12. A correct guess, changes the the entire form to red. 13. In range guesses provide the user a 'too high' or 'too low' hint on a label. 16. Invalid guesses are not added to history and user is notified of error. 17. A Progress bar tracks valid guesses to the 5 guess max. 19. A "Reset" button clears entire form as if no game has played. 20. A random number is generated each game. 21. 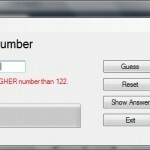 "Show Answer" button displays the 'number' on a label and allows the same game to continue with same random number.